Teacher resumes can be more complicated to create than those for other fields because of the plethora of certifications necessary and also the variety of teaching jobs available. Are you creating a substitute teacher resume, an elementary teacher resume, a teacher assistant resume, a preschool teacher resume, or a high school teacher resume? Don’t worry— with the information below; you can tackle any resume type and create an ace first impression with your new employer. An entry-level teacher resume will have the same basic sections as any other resume: Work Experience, Skills, and Education—plus a few other categories. For example, it’s advisable to list the actual classroom experience you got as a student teacher while working on your degree as well as the certificates you have gotten to teach in your particular jurisdiction. If you need an example to look at, make sure you check out the sample teacher resume at the end of the article! 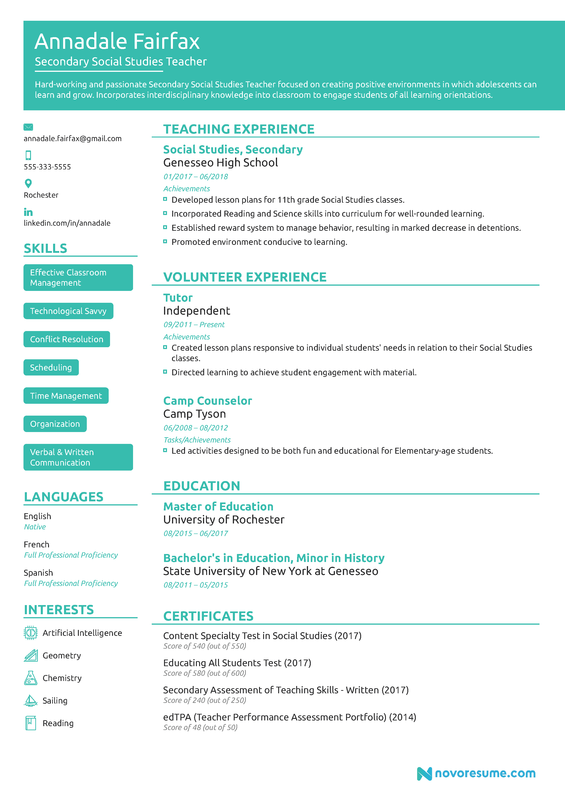 To create a teacher resume, start with your average resume template. Make a list of your work, volunteer, and educational experience, as well as your skills.Brainstorm everything that you might want to put on your resume—you can weed through it later to pick the most relevant information. Remember, every resume should be tailored to the position you’re seeking, so if you have some significant education experience it may be advisable to leave out some jobs you’ve had in unrelated fields. What if you’re a new teacher that doesn’t have a lot of professional experience? Many people in many fields run into this problem, so you’re not alone. You can still make your resume stand out! Then, make sure to highlight your education by placing it in a prominent position and including information about your courses and the skills you gained from them. You also want to include a section devoted to your certifications—a resume aspect unique but indispensable to the teaching field. Of course, you’re going to include the basic certifications that every teacher is required to get, but you may have advanced certificates too. It’s a great idea to include them! The professional summary is an aspect of the modern resume that many older sources don’t mention. It replaces a resume objective—instead of stating your own goals with the potential employer, you emphasize your unique self and what you can do for that employer. You are summing up yourself as a professional and providing information that might not appear elsewhere on your resume, like your attitude and your philosophy. This should be an extremely short paragraph. Sentence fragments are okay since the strategy here is to pack the most relevant information into a tight space. Attentive and adaptable Middle-Grade English Teacher skilled in using empathy and other emotional intelligence skills to effectively manage classroom behavior. Leverages student feedback to create dynamic lesson plans that address students’ strengths and weaknesses. Seeking a position with the New York City School District to use my teaching degree. English teacher, B.A. in Education, excited to work with the New York City School District. Many people are doing resume work experience descriptions wrong. Make sure that your descriptions of each position focus on measurable achievements rather than mundane, job-description style tasks! Obviously, your achievements will be unique to you and your teaching experience, but we can show you some examples of effective versus ineffective descriptions of achievements. Implemented an Individualized Education Plan for students with unique needs. Created a program by collaborating with the school library to foster an interest in historical literature and supplement Social Studies education. Established a reward system to manage inappropriate classroom behavior, resulting in a marked decrease in detentions. Awarded Teacher of the Year for the St. Lucy School District in 2016. Administered tests and made sure students didn’t cheat. Including teacher resume skills is a key piece of a successful job application. Other Requirements for a Teacher Resume? Every school district has a different list of application essentials. Your task is to find out exactly what they are and make sure that you meet them exactly. They exist for a reason, and a fastidious adherence to the guidelines makes you a much more attractive candidate.